Malta has historically been a meeting place for different cultures – whether it is President Bush and Soviet General Secretary Gorbachev ending the Cold War between the East and the West here, migrants from the South heading to the North, or indeed just as a place where people from all over the world can dive and enjoy cheap drinks, Malta attracts a lot of international love. 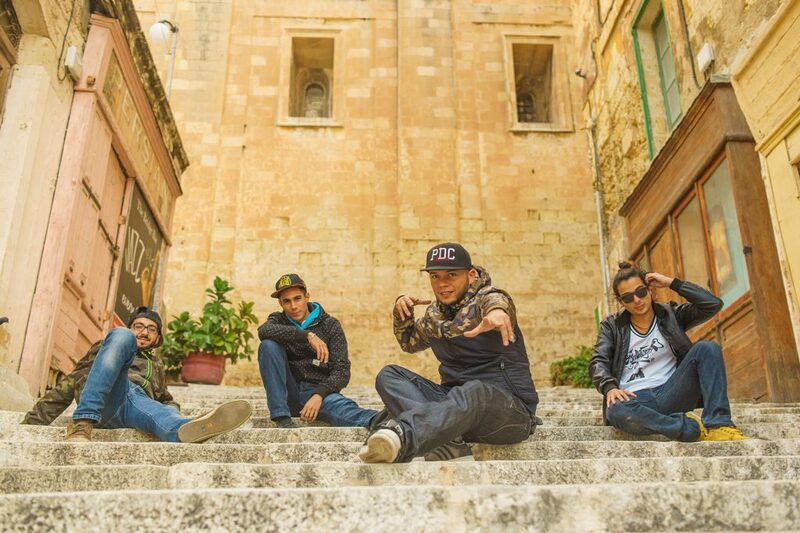 This role of Malta as a crossroads has led to many great developments, but one of the more musical ones is the Malta-based reggae/hip-hop outfit Pon Di Corner. 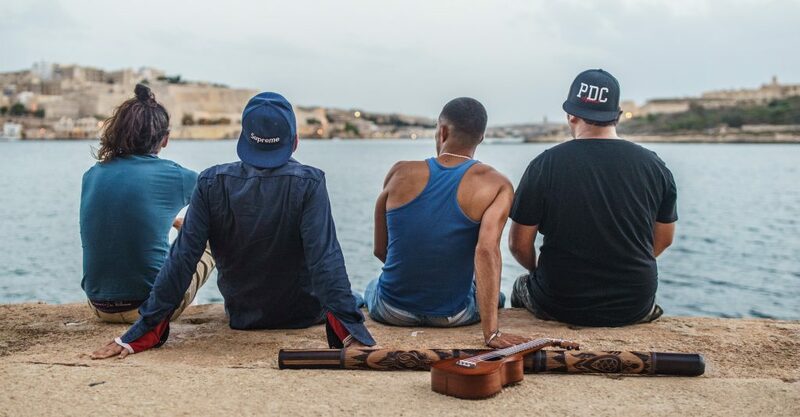 Comprised of four members from all over the world, and having fortunately all found themselves upon this Mediterranean rock at the same time, Pon Di Corner are now driven to show the world how interconnected we all really are, with their aptly titled debut album One World. The group – made up of Pupachile from France/Chile, Positive Rebel from Sicily, Mehding from France/Tunisia, and Ingenio from Venezuela – have just launched the 18-track album this week, with lead single One World featuring Jamaica-based Bajan singer Vanessa Bongo already sounding like a classic anthem. Trackage Scheme caught up with Pupachile to find out more about Pon Di Corner’s debut album, their inspirations, and their upcoming European tour. Trackage Scheme: You have features from 8 different artists from different countries – why do you think it’s important to have so much international love on your album? Pupachile: It’s something that came naturally with the time living in this island. We’ve met people from different countries, and we connected through music. We didn’t plan all this. It’s a project of two years with people crossing into our lives. We enjoy the fact that we can express ourselves with our language through music. We didn’t put barriers up and just let the flow goes as we wanted. What’s really important is that all this is made on this little rock and we are really proud of it. TS: What is the inspiration behind your band and your great energy? P: We could say music is our inspiration, as we say on one of our tracks of the album. The energy has been there for a longtime, each one of us has something to add, and the combo makes Pon Di Corner what it is. I think we are more a live crew that a studio musician stye artist. We met on the street, and we are conscious that this energy is a plus for us to transmit to our audience. Generally, people that come to our show have a good time and go home full of energy and with a big smile. TS: How did such an international group – France, Venezuela, Chile, and Tunisia – meet up and decide to base themselves in Malta? P: There were a few steps, the first was mine. 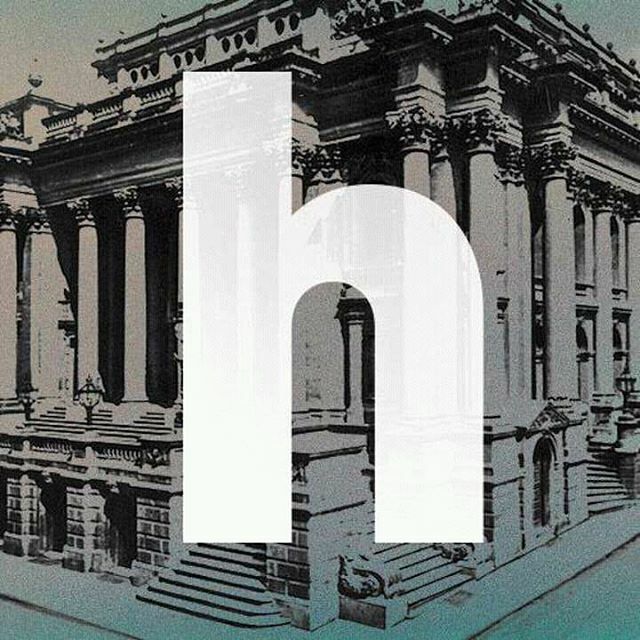 I’ve been based in Malta since April 2010, I started in an internship then quickly found a job. But music is something that always follows me everywhere I go. I was born in France with parents from Chile. I met Mehding who is half French and half Tunisian, and we started recording songs together. This was the creation of Pon Di Corner in 2015. This was followed quickly by the meeting of our Sicilian MC Cristian, and finally last year was the turn of Joel – half Venezuelan, half Portuguese. We are very good in Malta, we have created our own family since we are far away from our parents, and that is the foundation of our collective. You saw a lot of them at the release presentation, and we are greatful for their support. So we didn’t decide particularly if we were to stay in Malta or not, it’s just a coincidence. We are like fishes in the water in Malta. TS: So you guys feel like Malta is a second home? You feel comfortable in Malta? TS: Your music mixes reggae and hip hop in a new and interesting way. What are your musical influences? P: I can speak only personally, but I’m a reggae fan. I’ve collected vinyl for years. In 2000 I created a sound system in France called Positive Irie. We were mixing and organising parties in bars since 2002, with a lot of reggae but hiphop and rap soon followed in France during the 90s. I listened to a lot of latino american music because of my parents, like salsa or cumbia. I like soul and jazz too. I’m not so in electronic music; it’s the feeling that I like to listen to in music the feelings, the melody, harmony etc..
TS: I see. Between the 4 members of the group you have a lot of interesting and diverse influences and rhythms- is it easy for PDC to channel these different influences to write songs for PDC? P: Yeah, it’s easy. We all love music. We basically put an instrumental on and we freestyle on it. We have good inspiration. Then we settle down, we talk about a subject we want to talk about, and we write. The particularity of PDC is that we will write in our language. So we will mix French, Spanish and Italian. We use English as well to let the people in here understand, as English is the main language all around the world. This mix fits us well, and it’s like a stamp of our music. TS: Your new album One World is an expression of the idea behind PDC, that we are one people living in this world together. Do you think this idea is missing from today’s world? Do people sometimes forget that we are all from one world together? P: Yes, definitely. Basically this album reflects somehow what is happening in this world and also the positivity that can emerge from it. Joel, our Venezuelan friend is a good example. If you look at the situation in Venezuela today, you will understand why Joel has this positive aura around him and loves to spread it also. You know, we believe that hate and wars are just processes. To us, the worst thing is that people in general love to point differences out and not what links us all together. We are all born, we all live, we all die and so on. We are spreading a message of peace and unity because we strongly believe that it is the only thing that can heal this world. And you know sometimes, one tree that falls can make more noise than a forest growing! We can be the tree or the forest, it is not important, the most important thing is to focus on our common points. We are humans, entities trying to live together in this majestic world. Today we have the keys to hold this message, because on paper we are all different, but as you saw, we are just four big smiles that try to grab yours. TS: What do you hope people will understand and feel when they hear your music on your new album? P: We hope that people will feel the multicultural influences and positive aura. To be honest, like I said before, we love to play live because it is the raw expression of yourself that you are delivering and your true vision of music and passion. So in one sentence I would answer, we would love that people feel the same feelings we have when we share our music to them. Real smiles don’t lie, we hope that people will understand our spontaneity and happiness to do what we love: Music. TS: You have some upcoming gigs and a European tour soon – how are you guys feeling about that? P: We are really excited about that. First of all because we will have the opportunity to bring our music to our home countries. 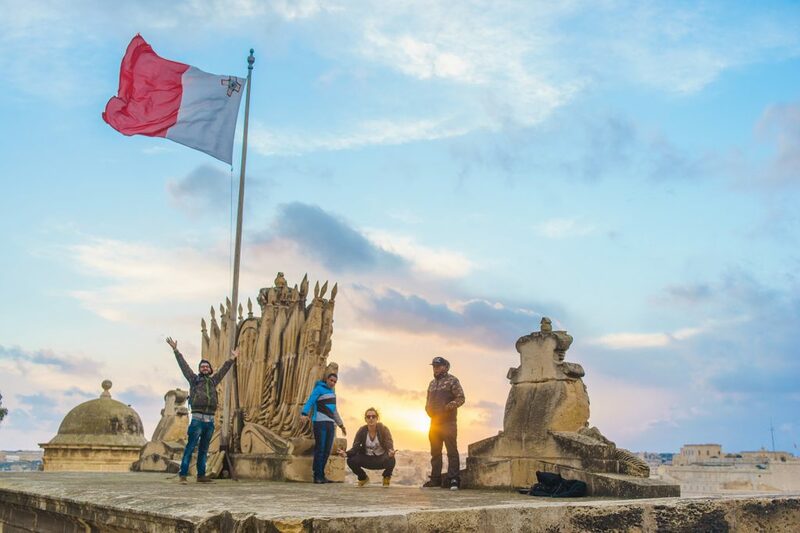 But most of all, we are so proud to have met and created this collective concept in Malta, an island that we all respect a lot for its values, people, culture, way of living and BEING! It would be for us the biggest accomplishment to represent Malta internationally and spread one of the most magic points of this island, its joy and majesty. TS: What can people expect from your upcoming gig at Funky Monkey? P: We will be presenting live our album and we are also inviting some of the artists who collaborated with us. This night will embrace our collective vision and perspective. We really wanted to bring to Malta one big live act and also include what we like most: mixing different musical influences. To chill and embrace the last rays of sun on some reggae rhythms, to feel the deepness and funky vibes of hip-hop, to interact and share our musical passion through open mic and freestyling sessions that is for us the key of expression and finally to dance and explode through some jungle and drum & bass experimental sounds. Through this party we will not only present our album, we want people to enjoy with us a musical journey that we hope will be unforgettable. TS: And last question – do you have a message for your fans? P: One message to our fans? We would rather say one message to everyone! Let’s share music and real positivity all together, let become one entity, one soul, one love and ONE WORLD! Let us express your vision through our music, let be happy all together, at least the time of one song! 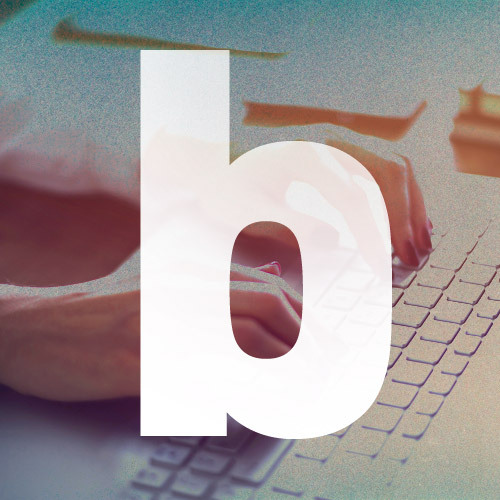 A big thank you to our followers, our friends and family that let us spread our vision. 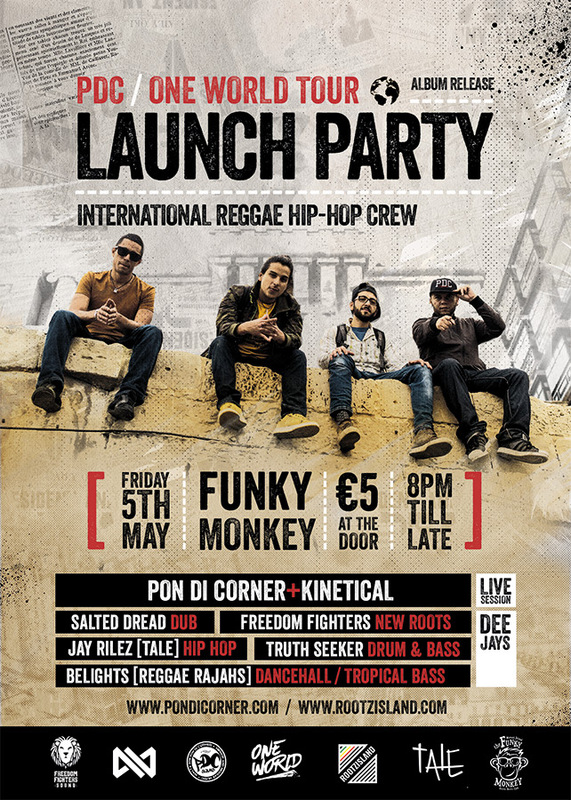 Pon Di Corner will be performing on Friday the 5th of May at Funky Monkey, Gzira. 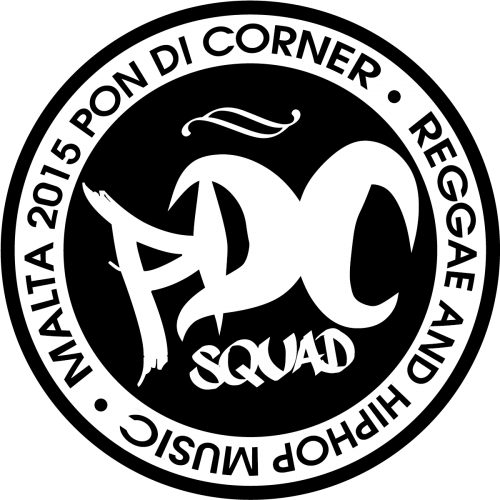 Pon Di Corner’s new album One World is available online now.